6pm Volunteer briefing (for those who can make it) @ Event HQ, Footy Oval. 7.30am - Volunteer Briefing - Warburton @ Event HQ, Footy Oval. NOTE: this is an alternative run course from previously advertised Redwoods Rush. The change has been made mandatorily due to fire protection operations underway further east of the Redwoods Rush course. We have been advised that while everything is safe on notice, and in order to be precautionary, we will use tehis new course routing to teh west, rather than east. The course is relatively similar, but unfortunately does not feature the Redwoods Rush. Hosted by Escape Your Comfort Zone - no timing, no pressure, but you still get a medal! 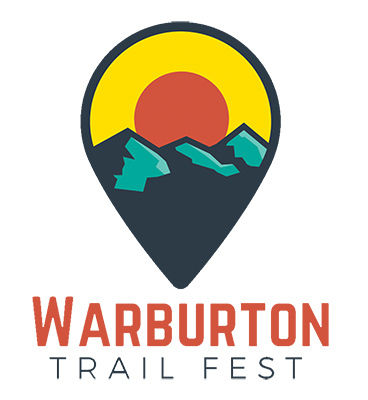 If you are a plus size person of any gender, OR would like to have a go at a trail event without fear of judgement, OR scared of coming last, OR feel intimidated by all the super fit, speedy runners, OR are afraid that the finish line will be all packed up before you finish... Then this event is for YOU! Walk, skip, shuffle, jog, prance, strut or stomp, its up to you! Post event celebration picnic in the park - bring a plate to share! And yes, there's Medals! Everyone gets a medal! Get your groove on as local duo The Flaming Moes belt out a few faves to bring you over the line in good cheer. Remedial massage therapy will be available, supplied by Renee from Renlea Therapies. $10 for 10 min blocks. A short hike, location / destination TBC, likely La La Falls, a 3km (total) return walk to a waterfall. test some of Salomon’s hiking shoes! LOCATION: Sign up at the Salmon tent at event HQ Expo! Salomon runner, Simone Brick, gives an powerful personal insight into how she succumbed to, battled and with the help of trail running and ‘bush medicine’ is owning and overcoming her mental health issues, along with a frank discussion on the stigma of mental health, and tips and tricks for discovering mental and physical wellness and balance via running and nature therapy. 6 for 6.30pm - Film - AUSTRALIAN PREMIER: PATH TO EVEREST - Kilian’s Quest. Enjoy a drink from the theatre bar before settling into a mountain til or three. No alcohol allowed in cinema during screening. LOCATION: Meet at Salomon tent. The youngest ever female to complete the 4Deserts multiday running series (Atacama, Sahara, Gobi and Antarctica), Jacqui has overcome addiction and a near fatal accident to quickly become one of Australia’s most accomplished multiday stage racers. And she’s looking to set new records in teh near future. Come and hear how she got into the multiday game, why it fascinates her more so than regular trail and ultra running, and what she’s learned to date in terms of preparation, gear and the mindset required to finish big adventure run beasts! She’ll be only days off having run the Alps to Ocean in New Zealand, so it will all be fresh and vivid! 7pm - Live music – Cog Café from Come and see Madz Got Rich play all your cover faves! Running the night trails or not, a good night to party at the Cog Cafe! *Any inflatable that can float YOU will suffice. We suggest sturdy ones that can take a rock bruising, something like a 'surf lilos' or tyre tube. One person per inflatable. Children U/12 require adult supervision. MUST have mandatory HELMET and FOOTWEAR! !